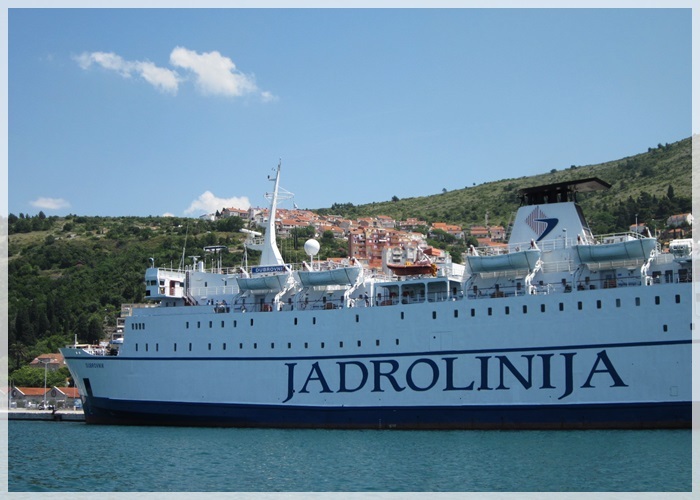 Croatia's largest shipping company, Jadrolinija, operates the only international ferry connection from Dubrovnik - the one to the port of Bari in the southern Italy. This ferry route is only seasonal. In 2019 it starts running on 15th of April and terminates at the end of November. During the spring and autumn the ferry service is twice weekly with frequent sailings during high season (6 sailings a week). The journey on this route is done by car/passenger ferry "Dubrovnik" which has a capacity for up to 1300 people and around 300 cars. The ferry features 149 cabins which comes in range of 2, 3, 4 berth (inside and outside). The price of a cabin includes a breakfast on overnight sailings. For those who doesn't wish to book a cabin there are airline style seats. The cheapest option is to book a deck meaning you can sleep in public areas such as lounge, outside deck or corridors. The floors are carpeted and you may spread out a foam or mattress. Onboard the ship you will find self-service restaurant with 224 seats, patisserie, coffeebar, video room, movie theatre, chapel, children's play area, a la carte restaurant and duty free shop. Please note that Dubrovnik is not connected by direct ferries to any other country beside Italy (no ferries from Dubrovnik to Montenegro, Albania, Greece and Turkey). There are also no direct ferries between Dubrovnik and Venice. To reach Venice from Dubrovnik you will need to cross the Adriatic to Italian side and continue your journey by car, train or plane further to Venice. One of the solutions would be to book one of two flying options between these two cities (Croatia Airlines and Volotea). Throughout the year Dubrovnik is connected with Rome by Croatia Airlines flights (via Split and Zagreb) as well as Vueling Airlines direct flights. EasyJet connects Dubrovnik with Milan in the summer season. Other ferry routes available for travelling between Croatia and Italy are those between Split and Zadar to the port of Ancona in Italy as well as catamaran routes between Istrian ports and Venice.